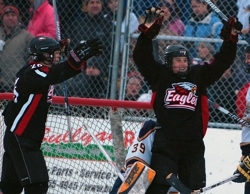 Minnesota's state boys hockey tournament is widely considered the nation's crown jewel of high school sporting events. If anything can top the annual spectacle in St. Paul, it isn't Texas high school football or Indiana schoolboy basketball. No, the better tournament might just be a few miles away in the southwest Metro in the form of the Section 6AA playoffs, starting with semifinal matchups that likely will feature three teams -- Minnetonka, Wayzata and Eden Prairie (pictured) -- ranked among the state's top four. Throw in Benilde-St. Margaret's -- a team that would be among the top two or three seeds in most any other section -- or ever-dangerous Hopkins, and you've got a final four at least as good as the one that will be showcased at the state tournament. How good are the teams in this section? Eden Prairie is 20-4-1 and the defending state champion, yet could only garner the No. 3 seed. Minnetonka (22-1-2), with its outstanding group of defensemen and deep stable of thoroughbreds at forward, is the No. 1 seed after an amazing regular season that saw the Skippers win their first 19 games. At No. 2 is Wayzata (20-2-3), which twice skated to overtime ties with Minnetonka and is on a 14-game unbeaten run. 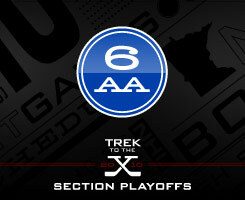 One of the state's best quarterfinal matchups also will be conducted in this section when No. 4 Benilde-St. Margaret's (16-6-3) and No. 5 Hopkins (11-3-1) meet on Thursday, Feb. 25, for the right to take on Minnetonka. Both teams feature elite-level goaltenders (Hopkins' Alex Fons; Benilde-St. Margaret's Jacob Meyers) capable of carrying a team to a section final and beyond. There seemingly is no end to the list of players worthy of keeping an eye on in this section, and not just from a fan's perspective. A platoon of trenchcoat-wearing, clipboard-carrying NHL and Division I scouts were ringing the Pagel Activities Center on Feb. 18 when Minnetonka hosted Wayzata. That sort of attention will only magnify in the section playoffs. Minnetonka's Justin Holl and Max Gardiner are not only Mr. Hockey finalists but also likely NHL draft picks. 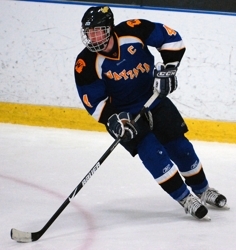 The Skippers' Troy Hesketh already has been selected by the Edmonton Oilers, and teammate Andrew Prochnow also could be a late-round pick. All four have committed to WCHA schools. The early favorite for next year's Mr. Hockey, given annually to the state's top senior, has to be Eden Prairie's Kyle Rau. The shifty junior center has 38 goals and 77 points this season as he has carried most of the Eagles' scoring load. Eden Prairie also has two more top-end juniors in goaltender Andrew Ford and defenseman Dan Molenaar. Wayzata's Tony Cameranesi, Scott Holm and super sophomore Mario Lucia rate among the best forwards in the section, and they are backed by an underrated defensive corps led by Lucas Whalen (pictured above) and D.J. Jones. Benilde-St. Margaret's freshman Grant Besse and sophomore Christian Horn are two of the state's best young players and top Division I prospects, and Hopkins senior Archie Skalbeck -- a 32-goal scorer who plays at a breakneck pace -- has committed to Colorado College. After playing one of the state's toughest regular season schedules, it's time to see how much the Skippers have left in the tank. The return to form of Minnesota recruit Max Gardiner, who missed about a month with a broken wrist, could be just enough to push Minnetonka through the state's toughest section. Looking only at Hopkins' record, it would be easy to say the Royals are out of their league in this section full of dominant teams. In reality, Hopkins routinely pushes some of the state's elite teams to the limit. The Royals lost to Wayzata in overtime in the regular season finale and skated to a 3-3 tie with Edina on Jan. 28. Senior goaltender Alex Fons is a game-changer when he's hot, and Colorado College recruit Archie Skalbeck has the speed and shooting skills to score on anyone.